RFM300-M refractometers (RFM330-M + RFM340-M) are the latest in a line of RFM models designed specifically for use in harsh environments and builds upon Bellingham + Stanley's 100 year legacy of quality instrumentation. 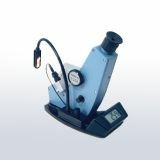 Incorporating wide beam optics, RFM300-M Series refractometers are capable of measuring non-homogenous samples such as fruit juice with pulp, opaque chemical compounds and emulsions that are normally difficult to read with optical refractometers or those digital refractometers that do not address the need to measure "difficult samples." A single large fan helps to regulate temperature as part of the Peltier control system. 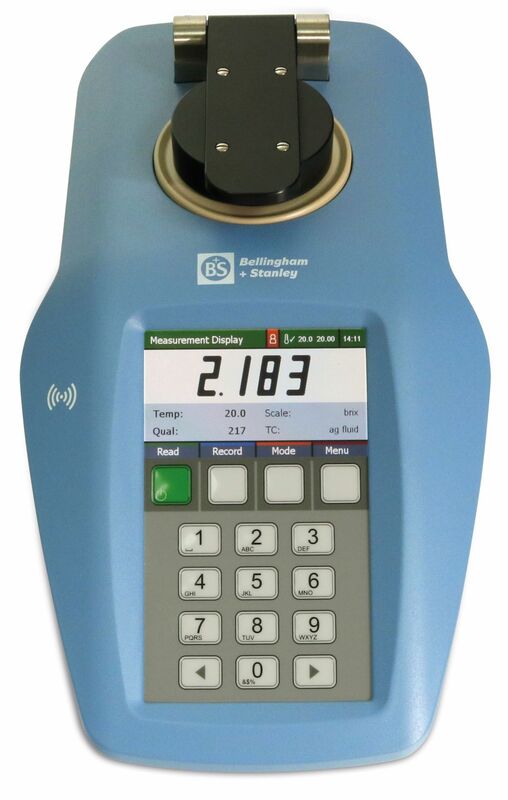 Operating at low speeds creates less noise whilst still offering the same excellent temperature control you'd expect to find in a Bellingham + Stanley refractometer. Positioned at the base of the unit, the RFM300-M's fan is designed to be protected from harsh environments, whilst still being easily accessible for maintenance. Whilst we believe that the touchscreen technology seen on our RFM-T Series refractometers is a class-leading interface, sometimes our customers want something a little more... tactile. That's where the RFM300-M comes in. The large, clear buttons and 4" high resolution screen help facilitate operation in factory environments, and combined with our latest GUI, help the operator quickly manoeuvre through the menus. 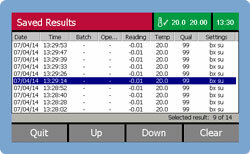 On-screen prompts support simple operation such as Method loading, calibration and routine maintenance guiding even the newest member of your staff. 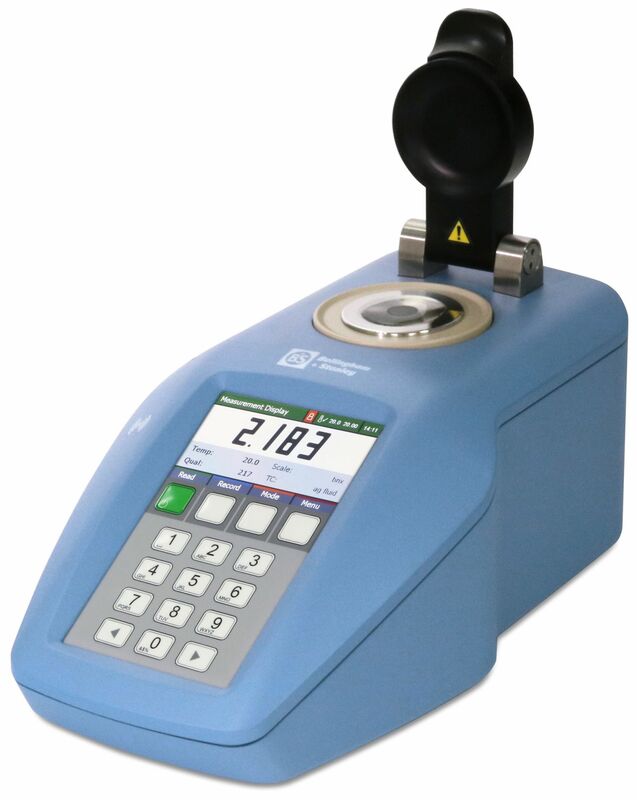 Measurements with the RFM300-M are made through a familiar measuring mode or by way of a simple Methods system with one-touch configuration of scale, temperature and data storage, with up to 8000 results being saved alongside pre-set limits that can be used as an audit tool Methods may be user-defined or selected from the on-board library. As an example, the 'Coffee Solids' Method allows for coffee type and daily offsets to be inputted, so that the %TS achieved using the refractometer in the factory match the results of the laboratory tests used to configure the freeze-drying process, producing instant coffee powder. 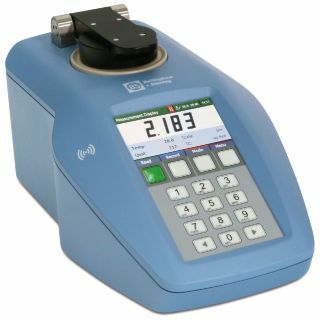 RFM300-M Series refractometers all come with software for your PC so that when connected to a network via Ethernet connection, the instrument can be remotely operated by an external service or support centre for diagnostics or even be used for training or installation qualification. USB ports are standard enabling connection to peripherals including external keyboards, barcode readers or memory sticks. Memory sticks can be used to transfer secure files or as part of a "Back-up & Clone" process that allows fast data back-up or configuration interchange across a number of instruments. 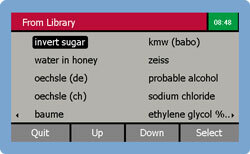 User Scale Library on-board 20+ preprogrammed scales including HFCS (3), wine (5), sugar (4), urine SG (3), Urea, sucrose SG (3), FSII, NaCl, Butyro etc. 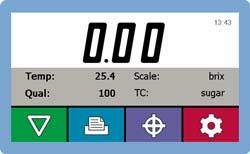 Plus customer programmable scales via PC. 19-35 RFM330-M Peltier temperature controlled refractometer with latest integral 4" full colour high resolution display, robust switch membrane keypad and USB/LAN connectivity. Supplied with pack of two RFID tags, instruction manual and certificate of conformity.